April 3, 2011 Dan O. Makes me appreciate sleepy time a lot more. Sent to investigate the murder of a teenage girl in a small Alaska town, police detective Will Dormer (Al Pacino) accidentally shoots his partner, Hap (Martin Donovan), while trying to apprehend a suspect (Robin Williams). But in spite of his guilt, he’s still determined to solve the case. Hilary Swank co-stars as a local detective who hampers Dormer’s efforts based on her suspicions about the circumstances of Hap’s death. This little treat here is directed by everyone’s new favorite director, Christopher Nolan. Yes, that Christopher Nolan, and somehow I have loved almost all of his movies he has put out, this is just not like those. The one thing that Nolan does right with all of his movies no matter the plot, is that he always can make everything so dark. He does a great job here of giving us a simple detective story, but adds on another dimension, with his questions on who’s the good guys, and who’s the bad guys. Nolan brings these questions up very well, and with a compelling score, and otherwise perfect setting for a mystery thriller, he does an effective job of filming this material, as always. My only problem with this film is that the plot is nothing amazing, and way too straight-forward I felt to actually be compelling enough to hold my interest. I stuck with this film because it’s Nolan, and as always, I was expecting some sort of a little surprise but the plot is already decided half-way through the film, and then we’re just left there to watch as really almost nothing happens. I think Nolan was trying to break grounds here by giving us the whole plot, and have us stay tuned to how it all played out. It wasn’t a bad approach, but I found myself a little annoyed by the sure predictability and slow-pace of this film. Al Pacino is amazing with any role that he does, and here as Detective Dormer, is no different. Pacino does a great job of showing this cop’s good side, as well as his evil side very well. I don’t think that Detective Dormer, was all that of a likable character, but somehow Pacino uses his magic, and us rooting for him, even though we don’t know if he’s the good or bad guy. Hilary Swank is spot on as the over-educated and under-experienced Detective Burr. She does a great job of putting herself into this role, and becoming a key part of this story, more than people actually expected. However, I thought the best out of the cast was indeed Robin Williams, who seems in need of a career re-boot. Williams plays the sly, devious villain so well here that I think they could have gotten rid of the idea of us seeing him so early in the film, and it still would have worked incredibly well. He brings that signature geniality to the role, and gives us the creepier side to his acting. Don’t do crap like Old Dogs Robin, do stuff like this! Consensus: Nolan’s dark direction works well with this material, and the performances are good, but the story just isn’t all that surprising, and doesn’t keep the viewers too glued in to the whole story, thus becoming an alright generic thriller. 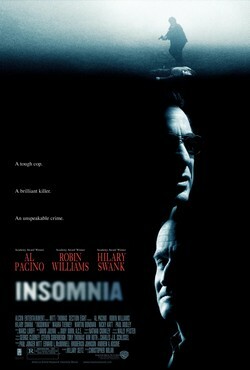 I definitely fall under the category of huge Chris Nolan fan, so when I saw Insomnia I had that at the back of my mind. I agree with your review. It’s a good movie, just not great. Well made, as always expected from Nolan, and Williams is definitely the best of the cast (Insomnia is another one of those strange Beard-Robin dramas that is good; you just never know with him!). What’s interesting about Insomnia to me is that it’s Nolan’s only remake (The Prestige was an adaptation), of the 1997 Norwegian film, which I have not seen but do have in Netflix waiting. I think, though, that this may be one of those films that’s less about the originality of the plot and more about taking an average plot in a new direction (lack of sleep theme). I thought that was very well done. Even I started to get a headache thinking about living somewhere with no sunset. In the end, for me, Insomnia is a good film I’d watch again (6.5, 7 I think is accurate). If we’re ranking Nolan, it would be second from the bottom (over Following). Of course, with Nolan standards are so high already! Great review. Love reading the blog, keep it up! Overall he does a good job with focusing on this plot, and taking it in a new direction, but surely not one of his best. Thanks, I’ll try! Of all the films I’ve seen by Nolan so far (w/ Following being the only one I haven’t seen). Insomnia is my least favorite because it’s remake of a film that I’ve only seen parts of. It’s a good film but not as engaging as Nolan’s other films. I want to see the original Norwegian film first and then watch Nolan’s version again soon when I give both of them proper reviews. I’m someone who wants to see the original first and then the remake. That’s how I do things as a critic. I know that this is a remake, but after seeing this I don’t really have any intentions right now to see the original, but one of these days I will and check both of them out. ya know, I can understand why this one wouldn’t be a favorite amongst Nolan fans, but for some reason, I just love it. I’ve seen it many times now, and always enjoy it. The cinematography, the performances, the music, the mood…it all works for me. I’d say Insomnia and Memento are my favorites by Nolan, with the Batman movies close behind. It’s alright, but for Nolan it’s just not my favorite. I guess others like it a lot more than me though. I enjoy this movie. Of course there’s not a Nolan movie I haven’t liked, and I’ve seen them all. Well, all feature films. Haven’t seen Doodlebug. I would say this is probably my least favorite, but that’s not at all to say I didn’t enjoy it. I definitely did. I think it’s a bit underappreciated even. Just not as much as The Prestige is. As far as execution, Nolan does a terrific job per usual with this one too. This is a good one by Nolan, just not my real favorite and I do feel like he really just makes a typical, run-of-the-mill thriller with no real big surprises. I suppose if this was made by anyone else I wouldn’t dislike it so much but Nolan can do so much better. It isn’t a bad film but for me it isn’t up there with Memento, Inception, The Prestige and Batman. Very true my friend! Could have been so much better. I think the material falls within his wheelhouse but at this point in his career Nolan couldn’t figure out how to make Insomnia his own. As it stands I don’t see much reason to watch this over the original; a remake should be able to make you have to choose between one or the other, and for me there’s really no choice at all. It’s a fun exercise but ultimately a pointless one. Nothing outstanding here, and even though I respect Nolan’s efforts, ultimately this is just an OK film.